As a long time fan of the National Hockey League (NHL), getting to meet and photograph special guests of the Syracuse Crunch is a huge thrill. Last weekend, the Crunch brought a two time NHL Defensemen of the Year, the first American to win Playoff Most Valuable Player and a Stanley Cup Champion to the War Memorial Arena in downtown Syracuse, New York. He played for my father’s favorite NHL team, the New York Rangers and his name is Brian Leetch. Upper left, Brian Leetch waves to the fans, Upper right, he drops the ceremonial puck for the game, Lower left, he signs one of hundreds of autographs, Lower right, a happy fan shows off Brian Leetch’s autograph. 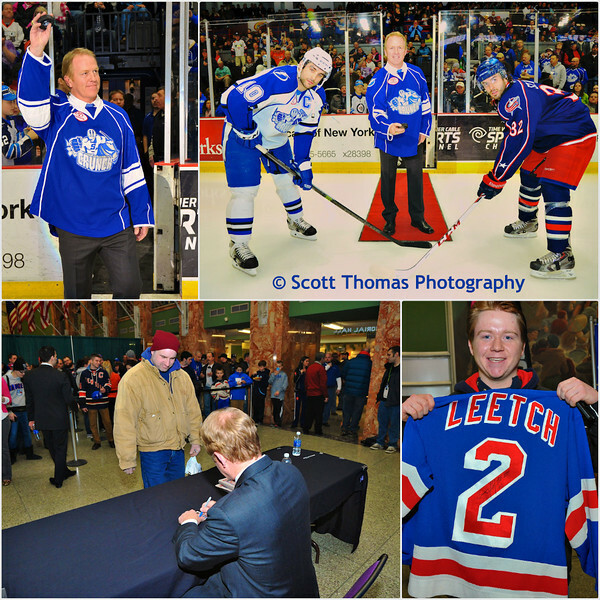 I photographed Mr. Leetch throughout the evening as he greeted a very enthusiastic crowd, dropped the ceremonial puck, signed hundreds of autographs for most of the game and later, after the game, was interviewed by Crunch Play by Play announcer Dan D’Uva in the post game radio show. 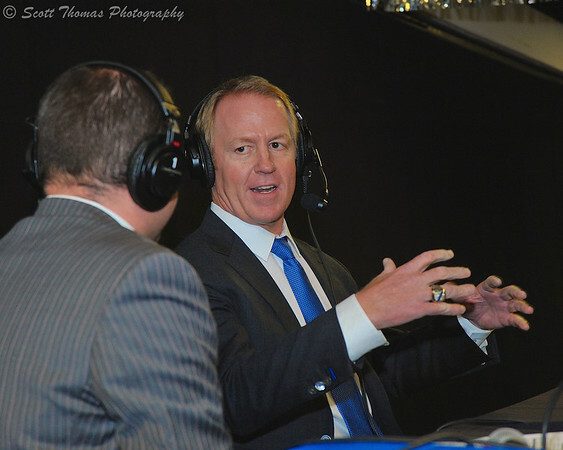 Brian Leetch talks with Syracuse Crunch announcer Dan D’Uva (with back to camera) during a post game radio show in the War Memorial Arena, Syracuse, New York on Saturday, February 8, 2014. Nikon D700/24-85G, 1/125s, f/5.6, ISO 1600, EV 0, 85mm focal length, bounced flash. This entry was posted in Sports, Weekly View and tagged 24-85mm, autograph, autographing, brian leetch, crunch, dan d'uva, drop, fans, flash, jersey, new york, nhl, nikon D700, oncenter, puck, rangers, sb-700, syracuse, war memorial. Bookmark the permalink.